My search for the perfect iPhone battery case has finally come to an end. At long last, I’ve found it. The PhoneSuit Elite iPhone battery case is the perfect blend of aesthetics and functionality. I’ve used several iPhone battery cases in the past and this is my absolute favourite. Today, I’ll tell you why I picked the PhoneSuit Elite as my go-to iPhone battery case. We’re also giving it away — so if you often find yourself running low on battery, read on and join the giveaway! The PhoneSuit Elite is a 2100mAh battery case for the iPhone 4 and 4S. Unlike other options available in the market today, this one is pretty good looking. It comes in white or black to match the colours of the iPhone 4/4S. At $79.95, it’s comparatively very affordable. Why am I obsessed with battery cases? Well, it’s because at one point, I was using iOS 5 beta — and most beta testers would agree with me that there was a huge battery bug in the software which drained the iPhone’s battery in half a day. Rather than searching for wall sockets to constantly charge my iPhone, I looked to battery cases to help me get through the day with my sanity intact. 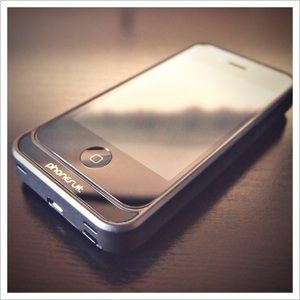 Before the PhoneSuit, I used a Mophie Juice Pack Air (also $79.95) which was pretty solid. However, it was also awfully bulky and had less battery capacity at 1500mAh. I would have also considered Incipio’s offGRID PRO but its $99.99 price tag and dual-battery marketing deterred me. Even though I no longer run a beta version of iOS 5, I still use battery cases to this day. It definitely provides peace of mind knowing that I actually have twice the battery capacity of other iPhone users. If you’re going to snap a case on your iPhone, why not make it a functional one? Every iPhone battery case will add bulk — that’s a given, but it’s how the PhoneSuit Elite does it that impresses me. Most of the bulk is at the back, sparing the side bezels and bottom segment (which houses the dock and charging mechanism). In my hand, it only feels slightly wider but much thicker compared to only holding the iPhone. Somehow, I prefer it — I feel that I can actually grip my iPhone better because of this. The charge indicators are hidden under a panel to help blend into the case’s design. They are only visible as long as the indicator button is held — and appear as blue LEDs! The camera cutout may seem a little deep but that’s because most of the bulk is at the back of the case. Due to this, you’ll find some dust collecting in the cutout and you may have to remove the iPhone from the case in order to clean it. Other than that, I haven’t noticed any deteriorations in image quality or flash wash out. The entire case is actually made up of 2 sections: a removable top section and the rest of the case. As I mentioned before, the side bezels are actually quite thin and this is true for the top section as well — which is made out of a thin piece of plastic with cutouts for the volume buttons, mute switch, headphone jack, sleep/wake button and the camera cutout. As you can imagine, there’s not much plastic left! The top section slides out of the case and in my experience, gets stuck at the volume up button very often. At this stage, a little nudging and twisting is required to free it; otherwise, it will break. Luckily, a spare top section is available with the case. See how thin it actually is? Now, the purpose of using a battery case is to obviously charge the iPhone with it. The PhoneSuit Elite is fitted with a 2100mAh battery and outputs that power at a rate of 5W. In other words, it’s able to fully charge your iPhone at the same rate as Apple’s standard wall adapter. To charge the iPhone using the battery case, flip the charge switch at the speaker-end of the case. Once enabled, the PhoneSuit Elite is able to fully charge an iPhone in around 2 hours. The case might heat up when charging and although that’s perfectly normal, it might not be entirely comfortable if the iPhone is kept in your front pants pocket. In the photo above, you’ll also notice a micro-USB connector in the center of the case and 2 more cutouts at either side — those are the speaker cutouts. The micro-USB connecter is used to charge the battery case and can be plugged into a USB port or a wall adapter. You even use the dock connector to simultaneously charge the battery case while it’s charging the iPhone. The PhoneSuit Elite will allow you to sync your iPhone by connecting the micro-USB cable to the case and your computer. Although in order to do that, the charge switch needs to be in the ON position. If not, all you’ll be doing is be charging the battery case (I learnt this the hard way). Should you buy the PhoneSuit Elite? If you’re out and about using your iPhone for most of the day and often find yourself running low on battery, the PhoneSuite Elite will certainly allow you to soldier on without a worry. You may be carrying a little more bulk but it’s a small trade-off for the convenience of longer battery life. If you’re looking for the best iPhone battery case that performs well and looks incredible, I would recommend the PhoneSuit Elite without the slightest hesitation. Here are a few images of the PhoneSuit Elite and my Mophie Juice Pack Air. We’re giving this review unit away! If you’d like to extend your iPhone’s battery life, join now! How do I win the PhoneSuit Elite? The giveaway is over. Congratulations, Elize Lim! You would have received an email from jackson@makeuseof.com. If you require any assistance, please get in touch with jackson@makeuseof.com before Aug 5. Enquires beyond this date will not be entertained. This giveaway begins now and ends Friday, July 27th. The winner will be selected at random and informed via email. Explore more about: Battery Life, iPhone 4, iPhone Case, MakeUseOf Giveaway. I have just given up on my second Phonesuit elite in 2 years. The first literally cracked up - cracks appeaed all over the back case. It was replaced under the so called warranty but it took an age and lots of chasing up and was not free! The replacement is just over a year old and the micro usb socket has failed. Sure its good looking and did the job but evidently cannot be repaired and the makers decline to advise how to open the case or to name a repairer... Other than themselves...? ... but they dont offer to repair - nor would I use them again in view of the delay and cost of a waranty repair which was a replacement last time. I have bought a cheaper and similar option from another maker and will bin it if it fails with less annoyance. Phonesuit elite is a nice piece of kit but not likely to last more than 16 months, very sadly, which makes it expensive! if I did not get the iphone 5 at least give me this. So do you ship these things to outside the US if we enter the comp? I dn't have an iphone bt I want to give as gifts to my relatives who have.. I wanna see this on an android phone! the phone uses the main battery or the additional as the default ? it charges separately or ... how long it takes ? The phone will always use its own battery. It can't use an external power supply. When charging is enabled, the case will charge the iPhone's battery. I'd like to give it to my daughter! I truly would just love to become the owner of this. This is something I have been wanting (but can not really afford) for awhile now. My son could really use one of these! great review!!!. I have a question, at the end of the day when you need to charge the battery pack, does it charge your battery phone as well, or you need to remove the battery and charge it individually? The case is charged via the micro-USB connector so you can actually charge both the case and the iPhone simultaneously using the same cable by flipping the charge switch on the case. Unfortunately, they don't have anything similar for Android. Thanks for this, if i win i will buy an iphone! Looks great - i want one...wait I also need an Iphone for that. I really could use the PhoneSuit Elite. Love the look of it. Looks cool. The iWife is drooling over my shoulder. :-) Here iphone is always charging. Yes, this will actually free iPhone from cables! Looks like a great product! Thanks for the giveaway! What a nice giveaway! I wish they made these for other phones as well, and even for other items. I live in hurricane country, and if you get evac'd you can have real problems with keeping your electronics charged. Having several of these won't save your life, but it just might save your sanity LOL. I have a waterproof case, would this need to come off, I'm assuming it would. looks nice and would be of great use!! nice give away!!!!! I don't have an iPhone, but hey, there's something awesome!!! Sounds like these camera grips you put on DSLR, but for the iPhone! You know, I hope so too. Fingers crossed! Im always out and about and never get the chance to fully charge my iphone, so thiis gadget is a definet need and want for me. It looks good aswell as having a good batery life!! if i win this, i would gladly throw away my $10 case and use thiis everyday. Thanks for the giveaway too. I have an iphone and im always out and never get the chance to charge it fully and is practically dead for half the day. this batter pack is an absolute need and want for me and would play a huge role in my life!! i Deffinately need to win thiis batery pack! There is something totally whacko with your giveaway entry form. I have only tried to enter two giveaways but they both exhibited the same psychotic behavior. When I enter the code and then my name and email address, an error returns saying that I have entered an incorrect code and that I should refresh the page and try again. When I refresh the page and enter the code, name and email again I get a different error message that reports that the email field requires a unique entry and my email has already been submitted. I am running the current version of Firefox. There is no reason why I should experience this kind of problem. When are you going to address and fix this issue? I cannot be the only one having this problem. I would guess that all Firefox users are probably having the same issue. It happens when the code is copied and pasted into the giveaway form. Try typing the code in next time and see if the issue is still present. Have never cut and pasted. I have always typed the code in. Am I alone in this problem?? That would be strange. You're not alone, Jim. It used to happen to me repeatedly in the past, but I would always get an email telling me I had been successfully entered in the giveaway. Recently it hasn't happened whether I cut and paste or not. Would Like one of those. Would Not mind one of those. what a beautiful gadget to own. thanks for the giveaway, anyway. Not bad, it's pretty sleek looking. Always wanted to get one of these but they are pretty expensive. $79.95 for 2100 mAh is a lot since I recently bought something similar, a 6600 mAh battery pack for $20. Although it was a portable battery pack instead of a case I can also use it to charge other things. Of course I would swap out my current case in a heartbeat if I won. Well, I've always preferred battery cases to battery packs mainly for the convenience of charging my iPhone wherever I am. Plus, I often find that my iPhone's battery would run out faster than other devices so that's another contributing factor. It is quite an elegant case. And yes, it does make the iPhone+case ensemble slightly bulkier the battery has to go somewhere. my question would be if phone falls will it handle the fall or would it crack? how well does it actually protect the face of the phone. Well, some cases were designed to protect the iPhone. Battery cases, on the other hand, were designed for power, contains a battery (which adds weight) and isn't ideal for protection. I haven't field tested the PhoneSuit Elite in terms of protection but I'm guessing that the outcome won't be good. I play games on my iPhone often and this case really comes in handy. I'm still a bit concerned about the protection though, plus that I plan changing to an Android in a few weeks. Of course, I would still love this if I changed my mind! I don't even have an Iphone, but I want this!